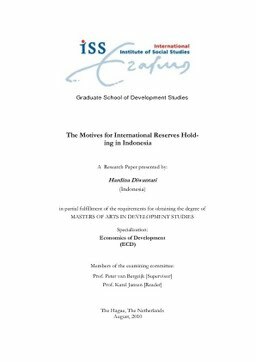 This research paper analyses long run motives for and the determinants of international reserves holdings in Indonesia. Using data from 1984:Q1 to 2009:Q4, an unrestricted error correction model (UECM) based on the Auto-regressive Distributed Lag (ARDL) is employed to analyse the long run relationship between the demand of international reserve and its determinant. This research also takes the financial crisis in Indonesia from the third quarter of 1997 to the fourth quarter of 1999 and the application of the floating exchange rate system since August 14th 1997 into consideration. This research paper finds the determinant of the international reserves holding in Indonesia. This suggests that Indonesia has not only hold a precautionary motive, but also a mercantile motive in the long term. The precautionary motive in Indonesia exists as a self insurance of the external payment imbalances due to trade flows and the foreign portfolio investments. The precautionary motive is also visible from the increase of international reserves during the application of a floating exchange rate system. Thus international reserve becomes a buffer to maintain exchange rate flexibility and as an instrument against negative consequences of financial crisis. The mercantile motive can explain why Indonesian export growth and foreign portfolio investment in the long term are positively correlated with foreign reserves holding aimed at managing exchange rate to support export growth activities.